The days are getting longer and Spring is announcing its arrival throughout the gardens. Bulbs everywhere are pushing their way up through the cold soil; daffodils, snowdrops, crocuses and tulips. The splendid Hellebores are still making their statement beneath the bare fruit trees. The mixed flowerbed in the car park has a display of both Sweet box (Sarcococca confusa) with its delicate scent, and Skimmia japonica with its bright red berries adding welcome colour. 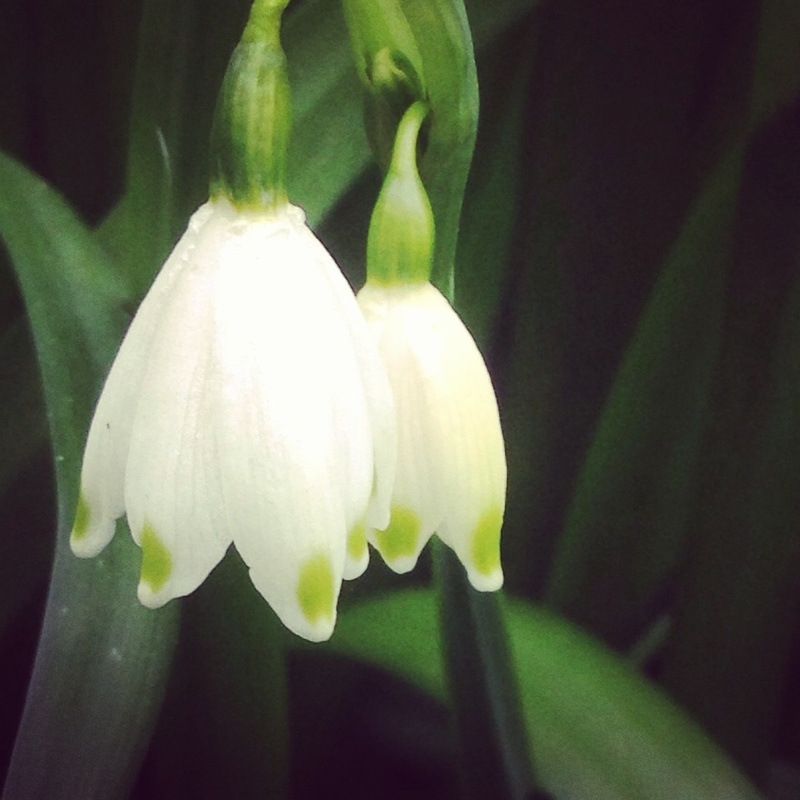 In the Old Pleasure Garden beneath the canopy of bare winter trees, bunches of Leucojum vernum, with their large white bell shaped drooping heads with speckled green spots, make for a pretty display. Over in the Kitchen Garden, Eileen one of our gardeners removed the protective black plastic covering and has given the soil a light digging. The soil is rich in colour and has a good tilth. In recent years Green Manures such as Crimson Clover, Phacelia tanacetifolia, Buckwheat and Lupins have been sown in different areas of this garden; together with the addition of our well-rotted compost every spring; these have been worthwhile measures by improving the soil structure. The black plastic cover will be pulled back over the soil to protect it from the heavy rains forecast. The soil temperature is still very cold but in another few months, when temperatures have risen, this kitchen garden will begin to fill once again with the new seasons vegetables. The herb garden has had its annual clearing. Any perennial herbs have been cut back, weeds have been removed, and new plans are in place to designate one bed per herb for the season ahead. The bronze Fennel and the giant Fennel each have an area to themselves. There will be one bed for curly Parsley and one bed for flat Parsley and so on. This will make for easier maintenance of the many herb beds and will help the students with their herb identification study. In the Herbaceous Beds leading up to the Shell house, work is in progress to eradicate a specific weed that resembles bindweed; it’s more delicate, which is to its advantage and to our despair. If even a small piece of the root is left in the soil it will form a new plant. So, drastic measures must be taken, and a digger was brought in to remove the soil in the particular area. The soil was removed and a mix of fresh soil and well–rotted compost was replaced. Elsewhere in the herbaceous borders, Miscanthus and Sedum are being cut back. The canvas is bare, but not for long, the tulips are on their way! In the vegetable field, the Sea Kale has been coved with up-turned black bins to blanch the young stems. The first delicate stems will be ready for harvest by the end of March. Rhubarb, a greedy plant has welcomed a mulch of well-rotted compost. Cabbage, Onions, Leeks Carrots, Jerusalem artichokes and Beetroot are still being harvested here also. In the glasshouses, two bays have been planted with new potatoes (early variety – Colleen), one crop is above ground already and we hope to be harvesting our new potatoes by the beginning of April. Delicious baby white turnips are still being harvested. The first Peas have been sown indoors and it’s also planned to sow Carrots and Beetroot this month. Module trays are filled with Salads, (they were raised in the Growing Room); successional Salad planting continues throughout the seasons however, horticultural fleece is being used to protect them and the Spinach from the frosty nights.